MOVIE SCORES, WOO! I just may be a total and utter fangirl for movie scores. A score's job is to bring color to a film, and they are always great indicators of what's going on in the story. Sometimes listening to a score on it's own can hold it's own magic as well. Only a movie score will bring cause to start a lightsaber fight, randomly recite an entire scene, run in slow-motion, and possibly even buy tickets to a John Williams concert at the Hollywood Bowl for 10+ years. But yea….what kind of person does that?! In case you didn't catch the news when it happened, Danny Elfman was the original composer for The Hunger Games. Suddenly on December 5th, we got the news that Danny Elfman was out due to scheduling conflicts, and James Newton Howard was to be the new composer. I personally was jazzed to have James Newton Howard aboard since he tends to score action movies, my most favorite being WaterWorld. What was concerning about this news was that this gave him just a little over 3 months to score The Hunger Games. Now typically this is one of the last steps of filmmaking, but 3 months does seem a tad short. 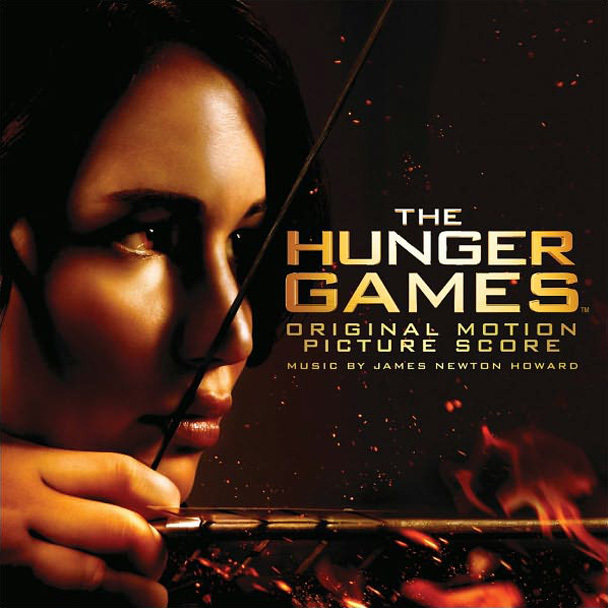 When the EPK of The Hunger Games was released we found out many songs that are in the film itself. It seems with the time constraints, not all the score is from James Newton Howard. Thanks to DWTC, they directed us where to listen to these tracks and I want to give them a special shout out for that FANTASTIC post. After a recent viewing of The Hunger Games, being able to listen to these individual tracks with the score album really helped me piece together where everything fit in the movie. Oh did I say this was a review? Well, I guess we'll call it more of a score review/analysis. For starters, the score is very amazing and satisfying for the story. I've always been used to movies where almost every moment is scored, but this one is quite different. The score exists only where it needs to be. It's not there when it's unnecessary, and it always there to support either a crucial or emotional moment in the film. I'll be taking this track by track. Feel free to listen along! Beginning the movie, we get introduced with some calming music that soon turns sour when the reality sets in: "until a lone victor remains". This becomes a small theme in the movie score's structure. This track actually does not seem to be used in the film, and seems to have been replaced by the following song: "Farewell". There is a theme within Katniss Afoot, that does get reused in the arena when Katniss is tracking Peeta. Going along the same lines of the companion album, this track shows influences of folk and country. This track opens up the District 12 establishing shots. After Katniss leaves her house, we see the dire straits the people of 12 have endured. This is their life, and their reality. The depressing yet hauntingly beautiful vocal humming certainly establishes the mood of this particular day as we hear it with images of people scraping for food, coal miners, and a mother hugging her child before sending him off to the reaping. Here's our first good chunk of score music, and quite fitting it being right under the inciting incident of the whole story. Peeta is reaped, making Katniss' problem a whole lot more difficult and setting the story into motion. The lower strings portray the gravity of the situation, and build up to the emotional moment of when for the first time in a very long time, they make eye contact. I guess no awesome score is complete without a choir, right? Newton Howard's use of choral voices in this track underline not just the sadness, but the amazement and wonder of the delicacies in the Capitol train. Extremely interesting components here! There is a small use of choir, but not in any shape of the previous track. The use of choral voices here articulate Katniss' feeling of uncertainty and fear at the Capitol citizen's excitement. I would not even say it is a sad track, and most definitely not happy. In fact, every Capitol scene in the movie never is happy or upbeat (with the exception of the interviews) because we are seeing the Capitol as it truly is. Big theme here in the movie during this track, as it gives off a large middle eastern vibe. Many different eastern instruments are used here, and will be a key component in displaying the Capitol citizens through music. Gives a foreign feeling to the audience. If that's not good representation of the books' intention, I don't know what is! A supporting track that does a great job of building the anticipation right before one of the biggest moments in the film. Katniss & Peeta's big moment! Musically speaking, a great movie score moment. I would call this a major theme in the score, but it actually accomplishes much more than that. As the audience will find out later in the film, this is Panem's anthem, which plays a big part in the film. I do have to say that the moment I realized this part of the score was also Panem's anthem, my head exploded. The Horn of plenty, the horn of plenty overflows. Panem will raise above, Panem shall﻿ raise above. May our nation never fall again...The Horn of Plenty overflows. Taking place in the Capitol, we get a recurrence of the foreign theme (Entering the Capitol) indicating this strange place. I was quite amazed they kept the window contraption in Katniss' room that changed views. Everything in the score speaks uncertainty until…she switches to the forest view on her window. Slightly comforting, yet obviously a downer. The music here really helps us understand just how Katniss is feeling here. The last section of this track goes a little militant and intimidating for the training segment of the film, and of course a reappearance of the foreign theme. Individual training time! Katniss sees what the tributes do best, and fits well next to the previous section of the score during the beginning of the training sequence. The music adds intense feelings and a variety of percussion to illustrate the militant atmosphere. This has got to be on Caesar Flickerman's "Let's Get Psyched" mix. Not used in the film, apparently. This sequence is not in the score album at all because it uses THREE different tracks that were all cut together to form the score from the moment the tributes come out of the tubes until Katniss escapes the bloodbath. You might be interested to know this piece of experimental music was done in the 1970s. Katniss and the audience is blinded by the sun and we get our very first look at the arena. The track gives an alarming sense of disorientation. Used directly after the countdown ends and the bloodbath starts. Interesting that this should be called "A Wasp On Her Abdomen" as the nature of the notes are sharp and jarring, much like the terrible hand of those tributes forced to take lives. Still no sound at this point in the film, Katniss has one of Clove's knives in her backpack and is making a run for it. This music helps give a sense of urgency that all the tributes feel, at least those who are still remaining. Yes, I'm going a tad out of order. This track is used in a couple different ways, one of them occurring before the next track. We first hear this music when Katniss and Peeta share a sad look when the careers have settled down at the base of Katniss' tree. This track has some mentions of District 12 with a slow, folky violin. The score moves on to focus on Katniss' pain and connecting Haymitch's pain for her, resulting in sponsors. As the music turns to fingerpicking, Katnis gets her parachute and finds relief. We also hear this exact part of the score when Katniss finds another kind of relief. Not from physical pain, but from human interaction. Katniss finds her relief from loneliness when she sleeps with Rue in the tree later on in the film. "Healing Katniss" seems to be a very fitting track name. Music for the part of the tracker jacker dream that goes into Katniss' loss of her father. We get high violins which are quite common for emotionally high moments in film. Pair this with a xylophone type instrument lightly in the background, and we get a sense of regressed childhood and a broken home. Katniss blows the food sky high. Little musical nuances here and there, but mostly percussion. Just a dab of guitar or possibly mandolin when Katniss gets in her shooting zone. On it's own, this piece of music is comforting. The point of view in the film switches from Katniss to Rue when the audience see her start to leave this plane of existence. An odd calming and soothing score is used with slow ambient music. Rue's being comforted by Katniss as she passes on. Somber guitar tells us she's gone and Katniss is left with her grief. "I'm sorry," Katniss cries. The music turns more full, and very funeral-like, supporting the emotion of Rue being surrounded by beautiful wildflowers. This theme will actually be repeated in the future of the film during the highest emotional scene, one also having to do with death: the nightlock scene. A sense of urgency, with a folksy sound. Parts of "Katniss afoot" appear here, and as Katniss gets closer to finding Peeta, there is a bigger build up. The score rewards finding Peeta with a musical relief. For a "romantic" scene, it does what it should. Higher guitar, slow to accompany what is going on emotionally with the characters. Guitar changes to a quicker pace, as that is when the feast announcement is made. It ends with light piano to imply sweetness, but kicks up to the "Booby Trap" track when Katniss is staking out the Cornucopia. A tender moment when Peeta is applying medicine onto Katniss' forehead. This is totally and utterly a true moment between both of them, and not just for the games. A very hopeful part of the score, and we even get a reappearance from "The Hunger Games" track. Very creepy wind instruments to start, the audience can tell something is about to go down. Intensity of the chase is in full movie score fashion when hear a sort of howl in the music to refer to the Muttations. As they get to the top of the Cornucopia and fight Cato, dissonant electronic guitar can be heard. Though it doesn't seem to be in the score album, there is a reference to the Capitol "foreign" music that can be heard in the film version when the three tributes are fighting on top of the Cornucopia. The final showdown becomes more of a sad theme, underlining the true message of the situation. An appropriate song choice for this part of the film, it is a little triumphant but a very modern orchestration which is perfect for the Capitol scene. In addition, this piece of music gives a big sense of danger and foreboding accompanying the scenes where Katniss and Peeta are crowned victors and Seneca Crane's end. This track is split in the film. For "Tenuous Winners" we have happy and relief because Katniss & Peeta are declared victors. For "Returning Home", we do not get a relieving score but a very sad one. Rue's death score appears here because there is one last emotional moment before the film draws to a close. It evokes Katniss' conflicting emotions. Although this is a great scene to put this scoring under, it works even better underneath the nightlock scene. Swelling music that reminds us of Rue's death also show us that the same music can be just as powerful seeing all of Panem reacting to Katniss and Peeta's decision with the nightlock. There are many themes in the score that are repeated mixed in with different musical tracks, however they all fit in together like a puzzle. The result is a cohesive score, so these repeated themes are very forgivable especially when you think of how little time James Newton Howard had. Given the time he was given, the result was an OUTSTANDING score that underlines the books' messages and supporting emotional and the most important moments throughout the movie. Thanks for reading!